Where next for gender pay gap reporting? The few large employers yet to submit gender pay gap reports now required by law have until midnight. Tonight’s deadline should bring a new era of transparency and debate around gender pay in the UK’s workplaces. With less than 24 hours to go, most of the UK’s largest employers have met their obligation under The Equality Act 2010 (Gender Pay Gap Information) Regulations 2017 and filed the first gender pay reports.Estimates suggest that almost all the 9,000 companies estimated to be covered by the law have done so.Initial analysis of the data submitted so far suggests 78% of employers pay men more, 13% pay women more while 8% report they have no gap. Seven sectors exceed the median hourly pay gap of 10% – construction, finance and insurance, mining, education, communication, electricity and gas, and professional and scientific – according to BBC analysis of the companies to have reported by 3 April 2018. The high rates of compliance is good news considering the process has been mired in controversy around the usefulness of the measures, the statistical improbability around some companies' reported figures and cynicism about the exercise.Free-market think tank the Institute of Economic Affairs said despite the wealth of new data on gender pay the government’s new pay gap reporting measures “fail to provide any meaningful insight into equal or fair pay for men and women in the workplace.”It believes that the crude figures paint a “misleading picture, especially for companies that have hired large numbers of female staff into roles in lower pay quartiles.” The pay gap legislation has also been criticised, especially in relation to professional services and finance firms, for omitting partnership pay. These most senior roles are where historically men tend to predominate in line with wider trends for a drop-off in female representation. Including this indicator would likely see the gap widen further. A new era for equality? Despite the criticisms, supporters and campaigners for the legislation have hailed today as an important milestone. Business representatives welcomed the deadline for the first gender pay reports and suggested that today marks a new era of transparency around gender pay and the structure of UK workplaces, including around the consequences of career choices on lifetime pay and productivity, employer and employee mindsets. Peter Cheese, chief executive of the CIPD, the professional body for HR and people development, said: “Gender pay gap reporting was dismissed by some as a blunt instrument of compliance. But as more and more results have been published we have seen that it is revealing some challenging truths about where the real issues lie in achieving sustainable change. Carolyn Fairbairn, CBI Director-General, said: “Gender pay gap reporting is an opportunity for businesses to drive change in their workplaces. For the first time, every larger firm will know the average pay difference between men and women in their company. What gets measured gets changed – helping to develop more inclusive workplaces and support more women into senior roles.“There’s nothing more important for firms than attracting and retaining the best possible people. Companies want to close the gender pay gap. 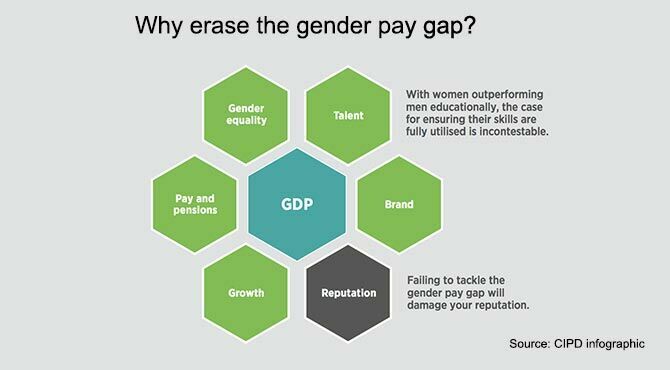 They have plenty of good practice to draw on – from great flexible working policies, to widening recruitment and engaging with schools to inspire young women into STEM subjects.“Firms have had plenty of warning and have no excuse for failing to submit their gender pay gap data accurately and on time. But businesses can’t close the gap by themselves. Many of the causes of the gender pay gap lie outside the workplace and will require a partnership between companies and government if we are to deliver long-term, lasting change.”“It is often said that sunlight is the best disinfectant. The increased transparency that gender pay reporting has brought has further fuelled the debate about how we’re supporting different groups in society towards fulfilling, fair, and rewarding opportunities and work for all." Do you have more men at the top, which may represent a failure to properly recruit or promote women? Are your female employees mostly in lower-paid roles? Why is those women’s work not better paid and why are they not being promoted? Has the pay gap reporting process uncovered any discriminatory practices in relation to pay, which could be a legal equal pay issue? If so you are legally obliged to resolve these immediately. Do your recruitment processes need reviewing? Are you advertising jobs as flexible working or offering skilled part-time roles that work for people with caring responsibilities, which are more likely to be women? Finally, you need to create an action plan off the back of this analysis – this is not currently mandatory, but the Fawcett Society argues that it should be and is urging all employers to set out what they intend to do to close the gap. Email Carla Foden or call Fiona Murchie on + 44 (0)1892 891334 to find out more about Relocate's new "Think Women" community.